Darkness, lack of air circulation and being tucked away and out of sight are an ideal environment for odors to develop. Smelly dresser drawers can be caused by spills, substances transferred from clothing, bacteria, mold, mildew, fungi, insects and rodents. Bacteria and mold or mildew are the most common cause of odors. It’s easy to clean, disinfect and deodorize the drawers- stopping your odor problem once and for all. No matter what the cause, it’s best to get to work on the problem as soon as it is discovered. The longer a odor problem is present, the longer it will take to remove completely, as the smell – and stain will permeate more deeply into the wood. Consider the construction of the drawer before starting to clean the wood. Solid wood drawers naturally resist liquid saturation and staining and can withstand a heavier cleaning treatment. 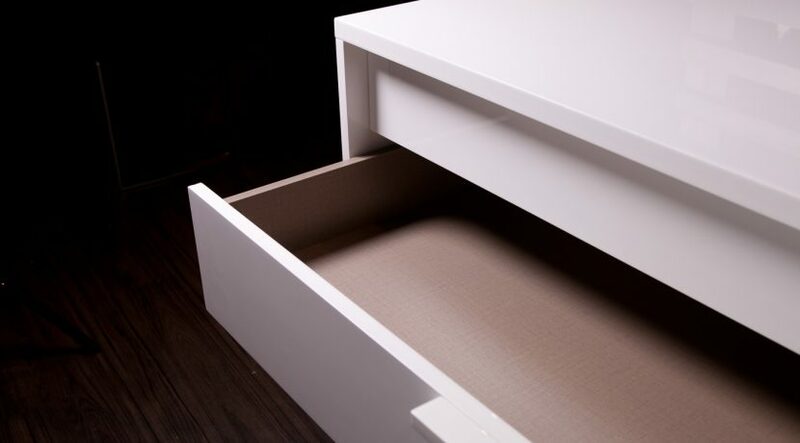 Inexpensive drawers made of flimsy material such as particle board need a much lighter touch. Particle board and thin plywood become stained easily, warp, absorb moisture and liquids easily. Remove all items from the drawer(s). If your drawers have liners or paper inserts, remove them before trying to clean them especially if the odor is strong. 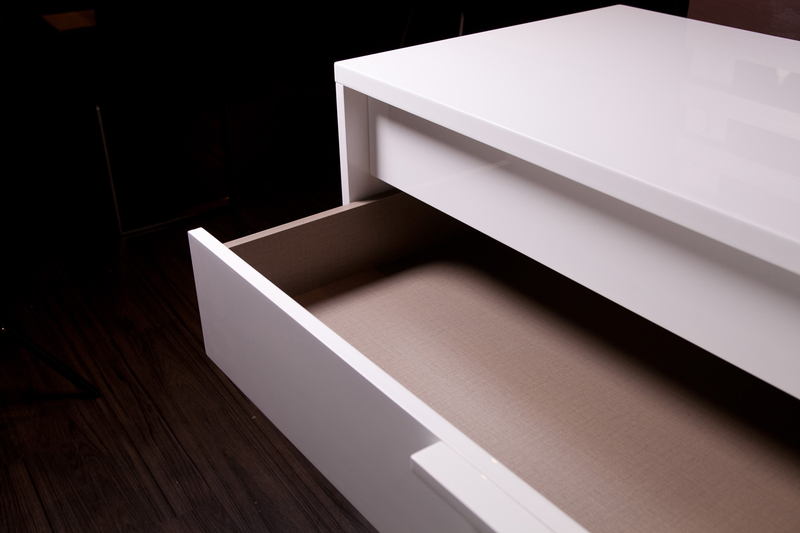 If the drawer does not have inner liners, first vacuum out crumbs or any debris that has accumulated inside the drawer. Wipe with a clean, damp, soft cloth. Now on to disinfecting. Borax and vinegar are two of my favorite’s disinfectants because they are effective, natural and inexpensive. Both products will deodorize, kill the bacteria, germs, mold and mildew. Since either is an excellent choice, you can use whichever one you already have on hand. Borax is a disinfectant, natural deodorizer anti-fungal and insect repellent. Borax is a white chalky mineral that you can find in the cleaning section of the supermarket. Because it’s a mineral, wipe the drawer surfaces thoroughly after cleaning to avoid leaving a white stain or discoloration on the wood. I like using Borax for odor control in a drawer because it does not have the odor that vinegar does and it is a great disinfectant. Borax is a mold and mildew fungicide which means it kills mold and then also controls it and stops it from returning. Thoroughly dissolve 1/4 cup Borax into one quart of warm water; the warmer the water the better. Use a clean cotton cloth and dip in the solution. Make sure to wring out excess water as you want the cloth to be damp NOT wet. This is especially important if you are working on a particle board drawer. Wipe down the whole drawer including sides and bottom. After disinfecting with the borax solution, follow by thoroughly wiping down the drawer using a clean damp cloth and fresh clean water. Dry thoroughly and let air out at least overnight. It’s an acidic, natural deodorizer and absorbs odors by breaking down bacteria. Vinegar does not leave a residue, and the sour smell goes away as it dries. Vinegar is a mild antibacterial as well as an anti-fungal. It kills most molds and mildews and is a natural deodorizer. Vinegar will work well on musty, moldy drawers to remove the odor as well as kill the bacteria. Some people do not like the odor of vinegar, but it will dissipate as it dries. Mix up a solution of two tablespoons vinegar to one quart of warm water. Use a clean cloth and dampen it with the vinegar solution. Be sure NOT to saturate the cloth especially when using on wooden drawers. Thoroughly wipe down the inside and outside of the drawer being sure to cover all surfaces. Let sit out overnight to “air out”. Handy Cleaning and Disinfecting Tip: When using either of the above methods, a great way to ensure success is to do this process on a sunny day. Follow the same steps above and wipe the drawer dry. Place the drawer outside in the sun, and the air and sunlight will dry the drawer quickly, further deodorize and sterilize the drawer. After disinfecting, a deodorizer will remove any remaining odors especially moldy-mildew smells that have penetrated the wood. Deodorizing also helps to keep the clothing and other items in the drawer smelling fresh. Sprinkle some borax in the drawer. Shake it around making sure to disperse it fairly evenly. Place the drawer inside a clean large garbage bag and tie or fold over the end. Let sit overnight. Vacuum out the borax after 24 hours. This should be all you need to totally eliminate any remaining odor. If there is any odor left after disinfecting and the drawers can remain empty, sprinkle baking soda in the drawers and vacuum them out a few days later. If you want to keep your drawers smelling fresh and odor-free, place one new box of baking soda in each drawer. I like to lay the box down and just poke holes in the top for ventilation. This way it does not spill when the drawer is open and closed. Over a period of several weeks any remaining odor should dissipate. Charcoal absorbs odors and impurities. Activated charcoal has been treated to have increased absorbing capabilities. Note that activated charcoal is not the same thing as charcoal briquettes. Although regular charcoal briquettes also absorb odors, DO NOT use lighter fluid pre-treated briquettes. Place several pieces of activated charcoal in a container and set inside each empty drawer. The activated charcoal will absorb any odors and “purify” the air in your drawer. As with baking soda, you’ll have to place new charcoal in the drawers every few weeks or so if you can’t find and eliminate the source of the odor. Be careful not to spill the charcoal or you’ll have a permanent black stain on the wood and clothing from the spilled charcoal solids. Fill several disposable plastic bowls or empty yogurt containers with kitty litter. I like to place the lids on and poke holes in them to make sure that the litter stays contained. Put one container in each drawer. Be sure to use cat litter that is unscented. (And be sure to keep drawers closed before your cat realizes you’ve just created a multi-level litter box.) Unlike baking soda and charcoal, kitty litter will kill bacteria while it absorbs odors. Replace the litter every month or so for continuous bacteria and odor control. Now that you have nice, clean odor free drawers, you will want to make sure to wash and clean the original contents before returning it to the drawer. This project is well worth it and it will be more pleasant the next time you go to open your drawer….now you just have to keep those clothes folded neatly.